I try to have some fun with few of my remaining hummingbirds. Weather is not helping me. It's getting cooler these days in northern hemisphere with not much flower left for these hungry migrating hummers. 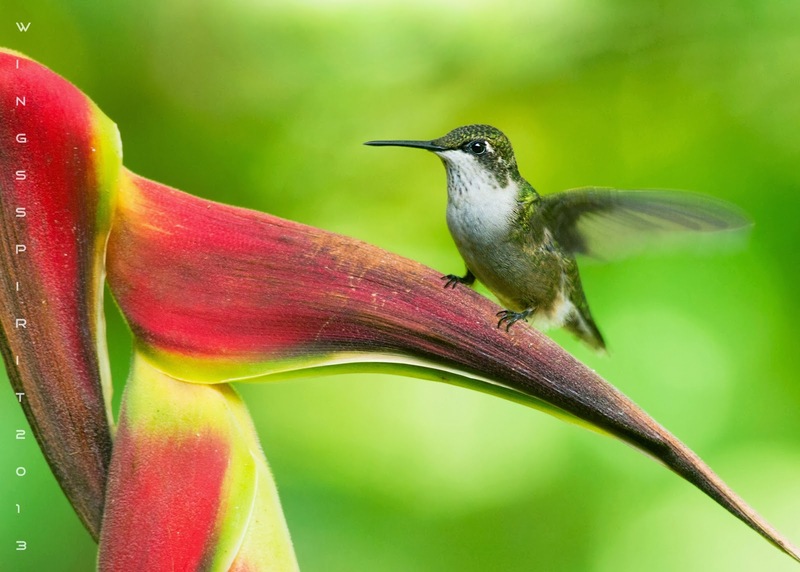 If you have watched hummers, you will know that they are territorial and will guard their food source and chase other hummers come in their way. My last male was gone two weeks ago, young and immature will hang around for another month, possibly they need to grow more feathers and eat more nectar to fatten themselves up for their first journey of non-stop flying across the Gulf of Mexico! For this shot, I waited for a week and they did not like this exotic flower I left for them. One day I was called from my work and I hurried out. When I returned, I noticed a tiny hummer sat on the flower. He flew off as soon as I grabbed my camera. Wow! I was not upset at all, Actually I was quite excited and thought they finally noticed my flowers! Then, it's another waiting game for me and he never returned. I decided to leave this flower outside under the sun and I know it will not last too long. But again, it does well in South America so I went ahead to continue my work and once a while came back to check to see if this "banded" hummer returned. Finally my patience got paid off, I snapped him behind my window. I especially love this shot with his wing flapping and show how eager and anxious he is ready for his long journey! Before I called my day off, I saw him flying and chasing other hummers on my deck. So I decided to give him a treat! I then set up my camera 15 feet from him and patiently wait for his arrival with all that vicious mosquito hoovering around my head. But all I cared was looking into my view finder to capture that magic moment. This young male was so curious and wanted to find out what I prepared for his dinner. He zoomed in the position precisely and showed me how great a hummingbird he can be (Click the link to see some amazing facts of a hummingbird)! Like a tiny flying vessel floating in the air! Gosh! I have imagined this particular angle for so long and finally I got one! I was so happy this evening! I can never love hummer enough!